First of all, I’m new to this field, so I apologize in advance if I ask stupid questions. What I want to do: I have a camera and I can only read the feed with an SDP file (which I open with VLC), so I don’t know its URL address that allows me to get its RTP feed. My goal is to create a DirectShow compatible virtual camera with this stream and then integrate it into software (DEWESoft). What I have done so far: to do what is described above, I built a graph on GraphEdit with “Moonware RTSP Capture Filter v4.2”. 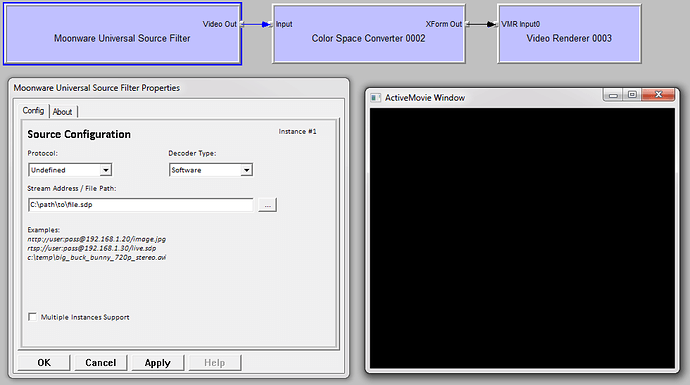 (to play the video stream via the SDP file) --> “Color Space Converter” --> “Virtual Camera Renderer” (to create a virtual camera). First, is it a good solution to do this type of graph? Are there other solutions to do this? My problem: then, as you can see in the image below, the filter is in its demo version, but I can’t find where I downloaded this filter (to get the paid version). I tried MUSF and webcam7 but this filter doesn’t seem to record with these two. Also, could I use the filter directly in GraphEdit, because I see “For only use in Moonware Studios Products”? PS: Excuse me if my English is approximate, it is not my mother tongue. MUSF works with Webcam7 and WebcamXP licensed versions. If the camera deliver a video stream via sdp I am quite sure it deliver using the rtsp protocol. What camera is it? The problem is that with the “MUSF” filter of the free version of MUSF, I can’t read the feed via an SDP file. Have you already tested it on an SDP file? For the RTSP protocol, I don’t think this is the case because on WireShark, I don’t see any RTSP frames, but only UDP frames (which are actually RTP frames I guess). The camera I use is not referenced on the web, but it is a camera from the manufacturer FirstSensor. Yes, I run SDP thru MUSF. D-link quite often use sdp for their rtsp and that works fine. First Sensor have a couple of IP cameras and they deliver both h.264/UDP and mjpeg. Of cause it must be possible to get the URL from the manufacturer. It must be possible to configure the camera for different parameters. Streaming mjpeg is done over http which should make it easy to find using wireshark. Yes, exactly. I thought you wouldn’t know, but as a result, it’s the Blue Next E4P camera and I have a little software to configure the camera (but I can only change the IP address, port, resolution, etc. and not the sending protocol). Well, that source configuration will not work. Why not ask the manufacturer for the protocol and url? Download Netcam Studio and see if you can make it work there. But strangely enough, the SDP file works on the “Moonware RTSP Capture Filter”. For Netcam Studio, “FirstSensor” is not present in “Brand” so I can’t add a new network camera. VLC, open vlc and use Media/network streaming in the menu. Same as in the filter. But… I don’t have the RTSP address. I have already tried with the RTP address but it doesn’t work. If you search the Internet for sdp it is standardized how to write an sdp file. I have never done this so I have no idea how translate this into something usable. I assume that @ should be the IP number of the camera. With that command VLC opens and shows the video from a Hikvision camera on rtsp. I just tried again, but unfortunately it doesn’t work. And yet the SDP file works, that’s what I don’t understand. Wouldn’t there be another solution to recover the RTP stream and integrate it into a DirectShow compatible virtual camera? Have you tested the ip number that the sdp file use in the vlc.exe …? Now I am out if ideas. Yes, I used this one. I too don’t see how to use the URL address, that’s why I switched to the “Moonware RTSP Capture Filter” filter that allows you to read the feed via an SDP file. But I don’t find it a paid version. The link to purchase the filter is sbove.